In the midst of a crowd, the Cross rise high, signifying the presence of the sacred in silent prayer. 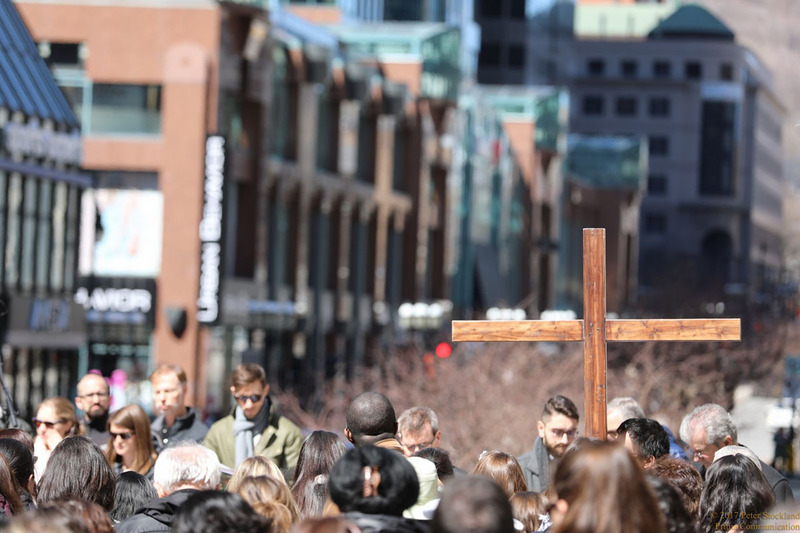 The photo of a public worship service in downtown Montreal appeals to me because of the way the Cross signifies the sacred, but the heads bowed in silent prayer affirm its presence. I chose to shoot the photo with the Cross in the bottom right corner, which is the second place our eyes normally track to on an image, not to subordinate it but to integrate it into humility of the random heads and faces that it foregrounds. I shot with a very shallow depth of field to blur the background because I wanted to make it an evidently urban scene without letting the city itself become the whole story. The sacred becomes inseparable from the city's service as a natural place of witness.